Police believe the same two people are responsible for stealing an SUV, smashing store windows to steal clothes and setting the stolen vehicle on fire. The Royal Newfoundland Constabulary is on the lookout for a man and woman believed to be involved in a string of break-ins at businesses in St. John's. Police say two separate break-ins took place at Arthur James Clothing Company on Newfoundland Drive, the first around 1 a.m. on Oct. 29 and the second three days later, at about 2 a.m., on Nov. 2. In both cases, security camera footage shows a man and a woman with their faces covered parking a black Jeep by a front window, using a tool to smash the window out, and entering the store and taking a considerable amount of sportswear and outerwear. 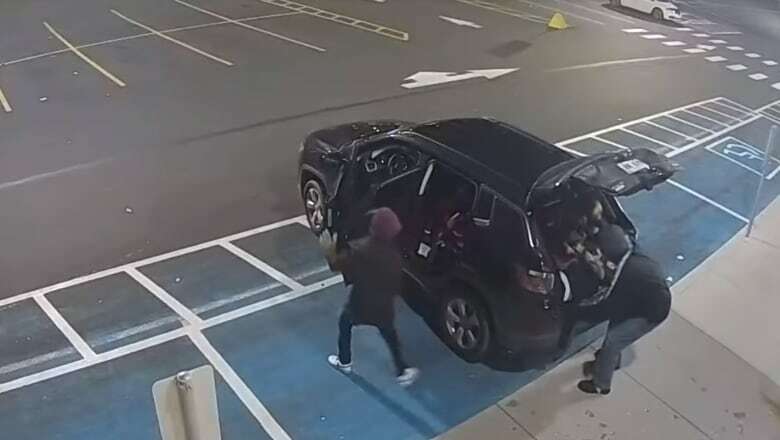 A third break-in took place around 2:30 a.m. on Thursday at Legend City on Hamlyn Road, and security footage again shows a man and a woman getting out of a black Jeep, smashing the window of the store and entering the business, stealing most of its contents. The RNC said the black Jeep Compass that was used in the three break-ins was also recently stolen from a St. John's area dealership. The Jeep was found around noon on Thursday near Groves Road and had been destroyed by fire. Camera footage from a nearby gas station shows a woman getting out of the stolen Jeep minutes before the vehicle was set on fire nearby. She then approaches an older model grey Pontiac G6 with a male passenger who is seen buying gas in a gas can, and proceeds in the same direction as the Jeep. Police are looking for more information on the man and woman believed to be connected to the break-ins, as well as information on the Pontiac G6, and warn that anyone found in possession of stolen merchandise could face criminal charges.